The Towers at Lotte New York Palace is about a 20-minute taxi ride from JFK Airport, in good traffic. 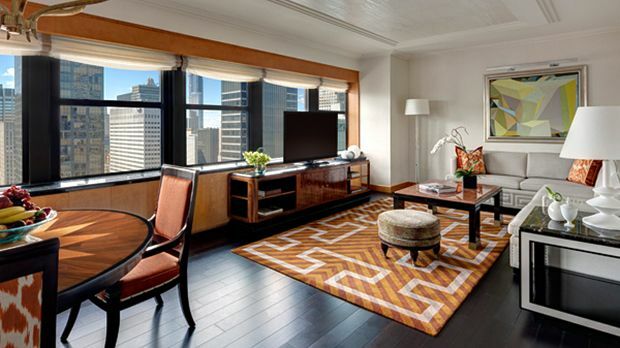 The property is located at 50th Street and Madison Avenue, in the heart of mid-town Manhattan, and a short walk from New York's Broadway theaters, Central Park, the business district, and designer shopping. 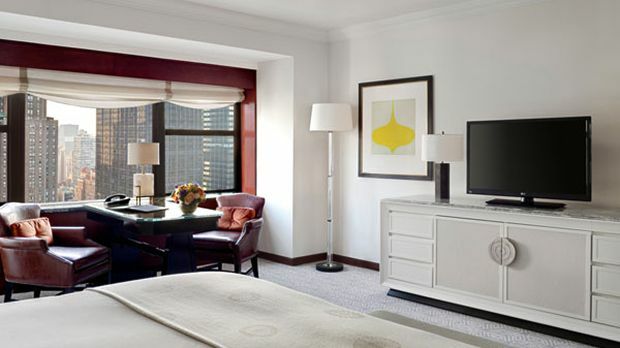 Famous for its appearances across a range of TV shows and movies, The Towers at Lotte New York Palace offers guests a gateway to a high-end Manhattan lifestyle that would impress the most demanding fashionista. 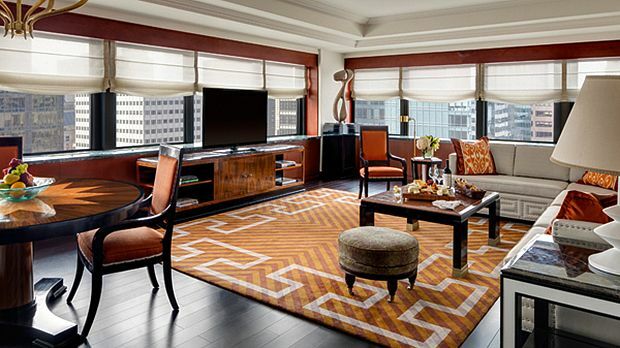 Choose from 176 gorgeous rooms and suites inside a gleaming modern tower. Many accommodations feature views of St. Patrick's Cathedral and the city skyline, and a handful have awe-inspiring rooftop terraces. Call up your Clefs D'or concierge, who can attend to your every need in whatever language you choose. Need a little relaxation? Head to the hotel's spa - or book a decadent in-room massage. Dining options abound at The Towers at Lotte New York Palace. Pomme Palais offers a fresh take on the classic New York City bakery, while Tavern on 51 offers an expertly curated cocktail list. Afterward, take the hotel's complimentary shuttle service to the Theater District for top-notch Broadway entertainment. Located within the landmarked space of the Villard Mansion at the top of the lobby's grand staircase, VILLARD offers a New American menu comprising of farm house breakfast fare. It's open daily until 3pm. Send an availability request with your requested dates to the The Towers at Lotte New York Palace. The newly redesigned towers rooms measure 465 sqft / 43 sqm. And feature custom furnishings in shades of sand, oyster and gold. All rooms offer touch screen technology and exceptional skyline views. Towers accommodations also offer complimentary internet access, a dedicated concierge, private reception area, express elevators and butler service. Recently renovated towers rooms measure 465 sqft. Or 43 sqm. And feature custom furnishings in shades of sand, oyster and gold. 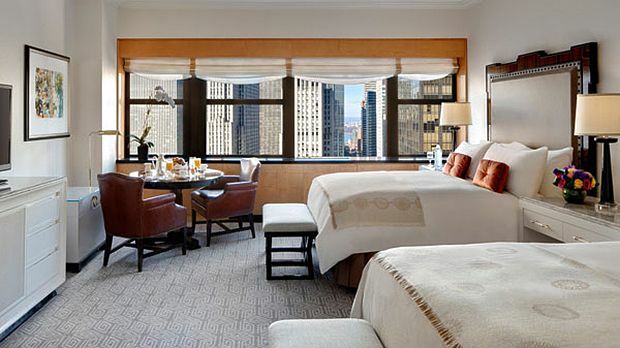 All rooms offer touch screen technology and exceptional skyline views. Towers accommodations also offer complimentary internet access, a dedicated concierge, private reception area, express elevators and butler service. Occupying the hotel's upper floors, these newly renovated Tower Executive Suites feature custom furnishings, touch screen technology and exceptional skyline views. All accommodations offer complimentary internet access, a dedicated concierge, private reception area, express elevators and butler service. Towers one bedroom suites are perched on the top 14 floors and accessible by private high-speed elevators. The bedroom contains a king bed, work area, and a luxury marble bathroom with a deep soaking tub and separate glass shower. All towers accommodations also include maitre d etage butler service, private reception area and dedicated concierge. Located in the exclusive towers section of the hotel with a private check-in experience, dedicated concierge and maitre d'etage services. Tower corner suites offer an extra-ordinary 1, 210 square feet or 112 square meters, perfect for entertaining. These spacious accommodations provide an exceptional floor plan with marble wet bar, l-shaped sectional sofa, dining table, guest bath and master bedroom. An expanse of windows affords city views. No detail was overlooked in the design of the tower corner suites that offer a distinctly residential feel.